a blend of a salty, sweet and sour flavor, all in one. Stop whatever you’re doing! 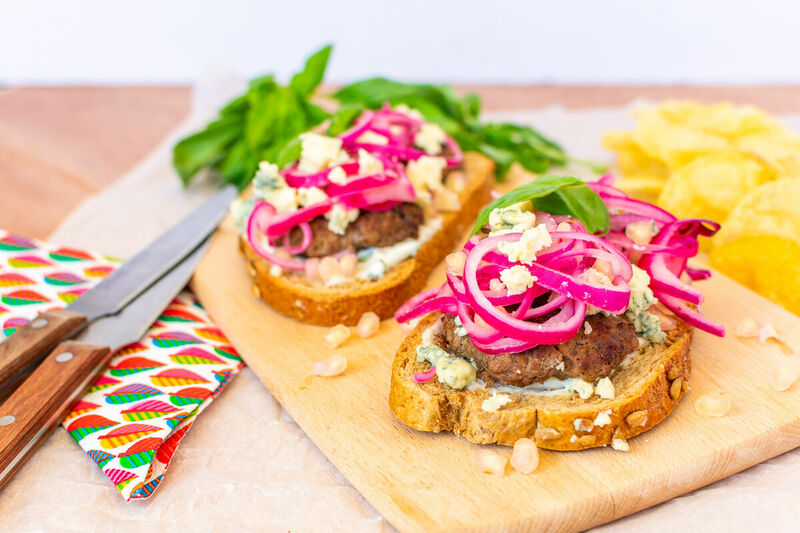 You have just stumbled upon the best open face burger ever made with a local touch. A few years ago I used to live in the Netherlands, Arnhem to be specific. It was this cool city in the east that had a small town charm even though it was a fairly big city. What I truly loved was the Friday market with some loud local farmers coming to sell their goods. There was one in specific that I used to visit every week. Ever since I moved to Curaçao I missed having a farmer’s market to go to. I’ve been to many craft markets though to still my thirst, but it’s not the same as going around a market and smelling all the fresh goodies and discovering a seasonal fruit or veggies. Even though farmer’s markets are not a thing here (I should really talk to someone about changing that), there are plenty of amazing farmers doing amazing things to build an agricultural culture on Curaçao. One of them—that also happens to be one of my favorite farmers—are a young couple that runs a farm and a farm-to-table café called Hòfi Cas Cora. 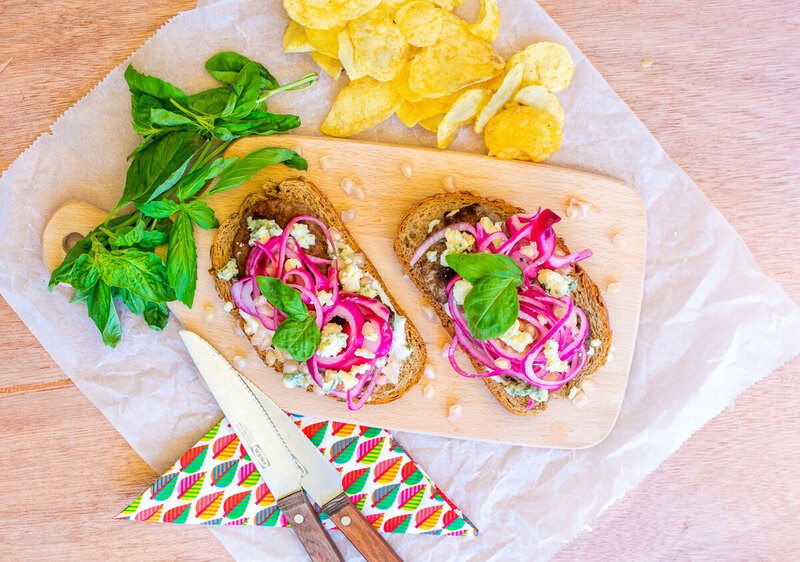 I got the chance to buy pomegranate from them, a fruit that is not often cultivated on the island, and I immediately thought of creating an open face burger recipe with pomegranate onion relish. The idea for the open face burger recipe with pomegranate onion relish came to me immediately when I saw that they harvested these amazing pomegranates. The funny thing is that these pomegranates are blush pink instead of red. Did you know there are different types of pomegranates? I didn’t, btw, I had to Google. A while back I made a hamburger with bread loaves and blue cheese. The bread loaves gave the dish an extra crunch and the blue cheese melts nicely into the burger giving it a nice salty taste. Then there was the time my mother-in-law made a pomegranate onion relish for Christmas. I feasted on the pomegranate onion relish and ate the whole thing by myself. The recipe was a Nigella Lawson original recipe that can be found in his Christmas recipe book, Nigella Christmas. The recipe was stuck in my mind and it was the first thing I thought about to combine with the burger. 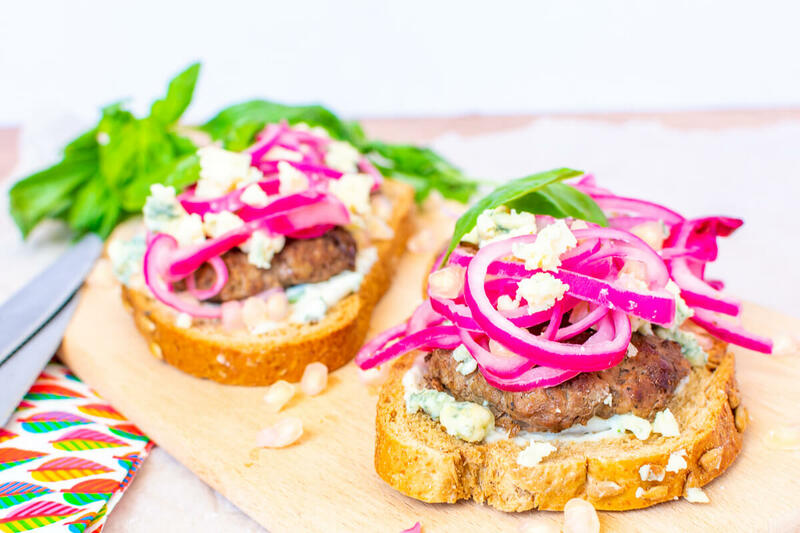 Blue Cheese, pomegranate, oven toasted loaf, is what eventually made up for this tasty open face burger recipe with pomegranate onion relish. I’m not going to lie, this has got to be the best and most fancy burger I ever made. I painfully learned that hamburger is not always the best dish to serve when you’re having friends over. But, this one might be the exception. 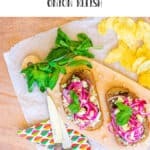 You can eat the open face burger recipe with fork and knife and it has all these fancy ingredients to tell your guests. Perhaps a nice dish for a dinner date with some salad on the side? Open the pomegranates and deseed them*. Add all the seeds in a bowl. Add the onions and lemon juice into the bowl. Set aside. In another bowl add all the ingredients doe the sauce, mix, and set aside. Take a ground beef and make 4 patties of around 2.5 inch in diameter. Heat the olive oil in a grill pan over medium-high. Add the patties and sear on each side for about 3 minutes. Turn the heat down to medium-low and cook the patties 4 minutes more on each side if you want it done medium. Transfer the patties to a plate. In the meantime, place the loaves in the oven and toast them for about 5 minutes. Take one loaf and add a spoon of sauce. 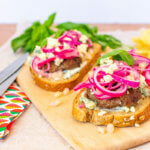 Place two patties on the loaf, crumble some blue cheese on top, and top it off with the onion relish. Garnish with basil leaves. If you don't know how to open a pomegranate then check this fun video out on how to and how to not deseed a pomegranate.